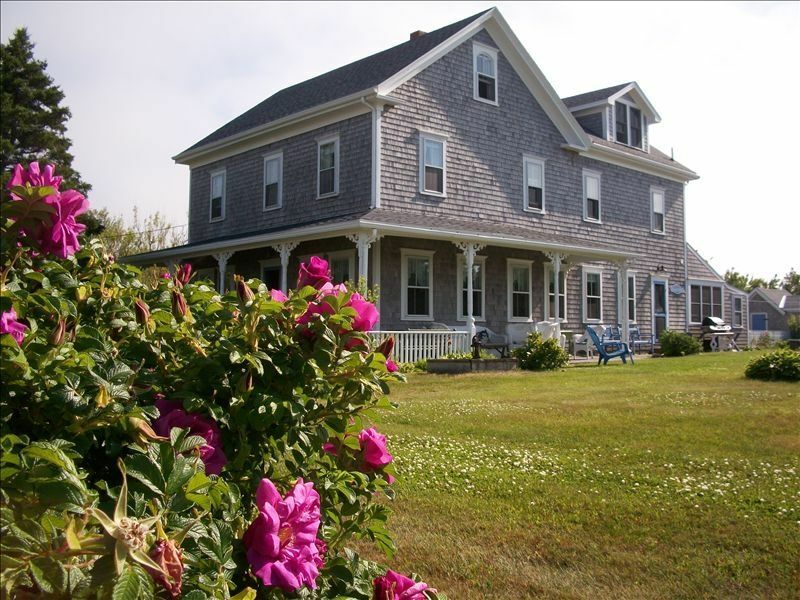 Summer Hill is a beautiful, old, Block Island farmhouse, that was formerly a Bed and Breakfast and is now rented by the week. It is perfect for family reunions, workshops, retreats, or for most larger groups. We also host weddings. Recently renovated and awash in floral colors, the interior of this 1885 house is tastefully, yet casually appointed. We have ten bedrooms, two living rooms, a dining area, and a country kitchen with pantry and laundry room. Our wraparound porch with distant ocean views is ideal for morning coffee and evening cocktails. Use the large lawn for a game of touch football or croquet and badminton. We provide the games as well as beach chairs. Located halfway between Old and New Harbors just off Ocean Ave., Summer Hill is close to the action, but tucked away on a quiet side street. B.I. 's beautiful beaches are less than a ten-minute walk and the town, with many shops and restaurants, is also a short walk away. Block Island is listed as one of the last great places by the Nature Conservancy and it is a wonderful spot to explore by walking or biking. very limited: go outside and play! wraparound porch with 20 plus seats, wicker chairs, benches, tables, lawn chairs, etc. Best birthday my husband ever had with all 22 of us. Never felt crowded. We cooked wonderful meals in the country kitchen and played outdoor games on the large lawn. The home was well-equipped with everything we needed and more! The owners were a delight to deal with. The location was perfect. We were all crying when we left. Need I say more? Our family and friends traveled to BI for a surprise 30th birthday party. SummerHill was the perfect location for our large get together. The house comfortably slept all 23 of us and the vast kitchen made preparing meals, storage and clean up a breeze. The best part for us was the large lawn. This is where most of our time was spent barbecuing, playing lawn games and lounging in the many chairs that were provided. I recommend this property without hesitation. Mike and Gail have a very special place here! It has everything you could want in a vacation home...completely accessorized kitchen, walkability to town and the beach, comfortable beds, large yard with outdoor games and wicker seating for a crowd, numerous beach chairs and several interior rooms to spread out and socialize. I have made my reservation for next September and looking very forward to it! Not a great experience at all!! I visited with family who had rented this house for a wedding.. As a guest for one of the nights, I was very disgusted to be awoken at 1am hearing that my bed needed to be checked for bedbugs.... Some were found in the upstairs rooms and once the hunt to secure the remaining bedrooms was on, we didn't like what we found!!. Two rooms (their beds) were covered in body hair. Another had a clump of hair in the sheets, (as if the hair in the drain at the bottom of the shower had been placed in the bed...). A wall in another room was smeared with some sort of nasal excrement. To top it off, our laughter at the situation was interrupted by a live black beetle scurrying down the hallway. I hear that the followin day yielded more bugs........ Needless to say - NOT a good nights sleep or a good experience. If you want to stay somewhere clean on Block Island, you might want to go somewhere else. Or just sleep outside. We are very sorry about this first negative review. We took this complaint very seriously and, though we have never had any issues with bugs or cleanliness, we called in exterminators immediately. The company found no evidence of bugs at all and gave the property an A rating. This certificate is available from the owners should anyone like to see it. We have many guests who return year after year because they love the property. We do take all recommendations and reviews very seriously and address all concerns in a timely manner. In the 12 years that we have been renting our home we have never had a review like this, we have never had complaints of bugs, never had complaints on the cleanliness. We ask that you read all of our reviews and remind renters that we are here to answer questions and have professional proof of the safety and cleanliness of our home. Summer Hill is a beautiful Block Island home on a lovely private piece of property located close to town. The beach, shops, restaurants and nature paths are all just a short walk from the home. All the rooms are nicely decorated, comfortable and clean. Views of the Island from the upper floors are magnificent. The country kitchen is fabulous for family meals and gatherings. There are plenty of kitchen supplies, two refrigerators, dishwasher and a large table that seats 12 people. We had 20 people staying at the house and never felt cramped. We were very blessed to have our daughter's wedding and reception on the grounds at Summer Hill. From the moment we saw the property we knew it would be perfect. The owners were so gracious and welcoming to our entire family and friends. The grounds were nicely landscaped and they went out of their way to make sure everything would be perfect for the big day. And even thought Hurricane Irene tried to crash our wedding party we were able to have a beautiful wedding that we will all remember for the rest of our lives. Thank you Gail and Mike for the opportunity to spend an entire week at Summer Hill and celebrate our daughter's wedding in such an amazing place.